Welcome to the Mother City. These are the first words you read walking out of the airport in Cape Town, South Africa. No one could have prepared me for that feeling, stepping onto the soil of the Motherland for the first time. My emotions were complex and overwhelming, but the feeling of excitement and sense of belonging stood out. My Fulbright grant was two-fold, conducting research for my doctoral dissertation and giving back through outreach and other STEM-based initiatives. 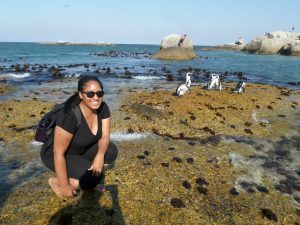 I spent my Fulbright year researching the impacts of climate change on indigenous flora throughout South Africa. 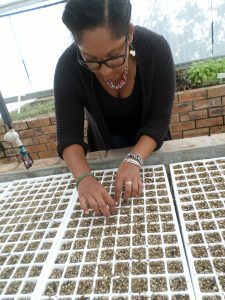 The first half of my research was used to collect seed and propagate over 1,500 Pelargoniums, a highly-diverse genus of flowering plants, at the Cape Peninsula University of Technology (Wellington, Bellville and Cape Town campuses). These plants are now growing in reciprocal transplant gardens at the Kirstenbosch Botanical Garden in Cape Town, Western Cape and at Rhodes University in Grahamstown, Eastern Cape. Growth and development data will help me understand the effects of genetics, the environment, and the interaction between these two processes that aid in Pelargonium adaptation to different environments. Understanding plant adaptations to their environment sheds light on how plants will respond to the unprecedented rates of climate change. The second half of my research was used to conduct 15 field expeditions throughout the country. 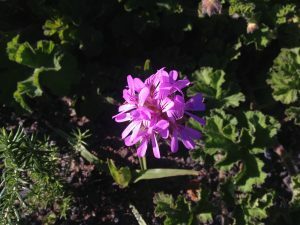 During these expeditions, I examined hundreds of Pelargoniums in their natural habitat (i.e., species community composition and habitat descriptions), collected genetic material, and measured an array of plant functional traits (i.e., plant height, which can be used as a proxy for fitness). I was also able to recruit South African undergraduate and graduate students interested in ecological field surveying methods. I led two field trips throughout the Northern, Western, and Eastern Cape provinces where I taught proper ecological and environmental field collecting methods, specimen preparation techniques, and data analysis. I have always been a firm believer in outreach and mentoring. I took this passion to several programs throughout South Africa, including my work with two environmental nonprofit organizations. With one organization, I helped with greenhouse maintenance and planted an orchard at an orphanage during Nelson Mandela’s Day of Service. 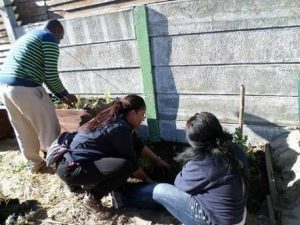 I also worked on a more regular basis with SEED, where I led greenhouse maintenance trainings, assisted with permaculture trainings, and assisted in the building of sustainable home gardens throughout the Mitchells Plain township. The ‘Food Freedom’ program is unique in that it equips community members with their own food garden, which we install and help maintain throughout the family’s tenure in the program. There are also educational seminars, home check-ins, seeds and seedlings, compost, and other resources provided to ensure sustainability. I also taught children about the benefits of a clean environment and the science behind composting through the Rockland’s Primary School Litter Program. The Fulbright Program has afforded me many personal and professional opportunities. During the course of the program I was able to interact with scientists, students, professors, community leaders, clergy members, organizers of social movements, city planners, embassy officials, journalists, artists, and the list goes on and on. Building these personal relationships also helped me feel at home and facilitated a greater understanding of the country’s people and history. I even have an extended family that I visit every time I am in Cape Town! Professionally, I am continuing the research I started during my Fulbright year. I go back yearly to evaluate my gardens’ growth and survival rates, as well as collecting additional information on plant populations I have not yet visited. This past year I was able to share my work at the Fynbos Forum, an annual meeting of researchers and stakeholders to discuss research results and conservation management issues for the sustainability of Fynbos ecosystems. I look forward to continuing this work in the future, as I have been invited back to start a new research project focusing on climate change resilience of plants throughout the Cape Floristic Region. 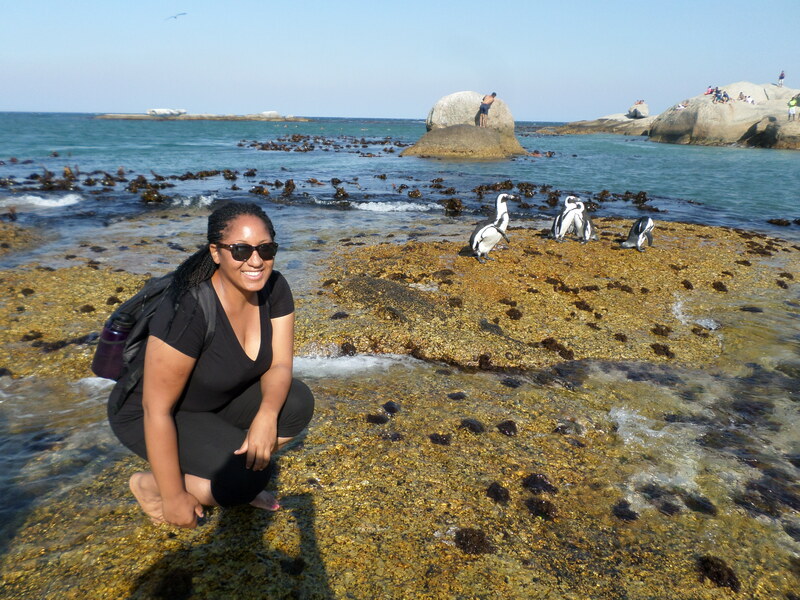 Have questions for Tanisha about her Fulbright experiences in South Africa and as a Fulbright Alumni Ambassador? You can reach her at T.Williams.alumniambassador@fulbrightmail.org. This is an extraordinary journey! Congrats on your research and success. I look forward to your future articles on climate change, impacts on various plants, and certainly impacts on future generations of people.